Did you know that every year approximately one in six U.S. citizens get sick from food poisoning? Despite our best efforts, over 100,000 of those people are hospitalized and about 3,000 die. In the wake of a Salmonella outbreak this month that killed two people and left hundreds sick (all from cucumbers), scientists have proposed a new idea for fighting food borne illness. Genetically modified plants may be able to combat – even eliminate – the threat of food poisoning. This new strategy involves modifying plants so that they produce antimicrobial proteins called colicins. These proteins are capable of killing E. coli and can later be extracted and injected into contaminated foods. Scientists from two German companies (Icon Genetics and Nomad Bioscience) are leading the initiative and have so far managed to engineer leafy beets, tobacco, chicory, spinach, and lettuce to produce colicins. Even better, they identified a combination of two proteins that can kill all of the major E. coli strains that cause disease in humans. The study was published last week in Proceedings of the National Academy of Sciences. Foods most susceptible to E. coli contamination include beef, pork, and organic produce (which is often treated with manure instead of fertilizer). According to the WHO (World Health Organization), nearly 10% of E. coli infections can lead to life-threatening illness. 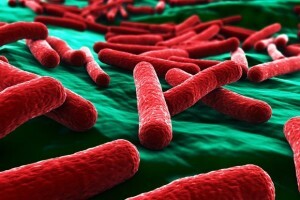 E. coli bacteria (pictured below) produces colicins naturally as a way to defeat other E. coli strains. Because they are aimed to inhibit or kill other bacteria, colicins are extremely toxic. Scientists found that microbes used to produce these toxic proteins usually die in the process. To avoid this scenario, the team of scientists used plants as hosts. The experiment was a success and they found the GMOs capable of producing 12 distinct types of bacteria-fighting proteins, all capable of killing E. coli. “The yield that they’re getting through their plant source is much larger than what we would normally make in the lab with E. coli,” said structural biologist William Cramer. Team leader Yuri Gleba believes that since colicins are so potent, they could be an economically effective option for treating contaminated food. When sprayed with a combination of colicins, contaminated meat showed a significant decrease in E. coli after just one hour. “Normally the meat industry’s ready to spend two to five cents to treat one pound of meat. Our costs are lower than that,” said Gleba. Even better, colicin treatment won’t affect the taste or quality of the meat. The scientists hope to gain FDA approval as soon as possible. Gleba has high hopes about the new process and believes that our digestive systems can easily handle the tiny amount of colicins needed to treat contaminated food. Francisco Diez-Gonzalez, a scientist specializing in food safety, is not so confident. “To get approval for a food additive, you have to present a lot of toxicology studies and effectiveness studies. I think it would be difficult to make the case that these colicins should qualify,” he said. Still, he hopes the plan works. “The feat of getting this protein to be expressed and produced at significant levels in plants is quite remarkable. Just from a technological, scientific point of view, I think this study has a lot of merit,” he said. While the FDA commences with the necessary approval processes, Gleba and his colleagues are busy examining potential methods with which to prevent future Salmonella outbreaks.